Here comes a hello from our most common and dearest trees. 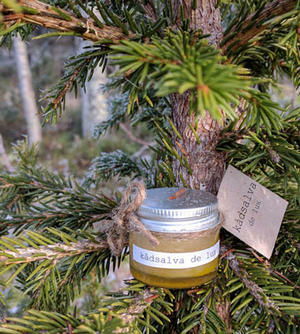 From the fir - a delicious resin ointment. 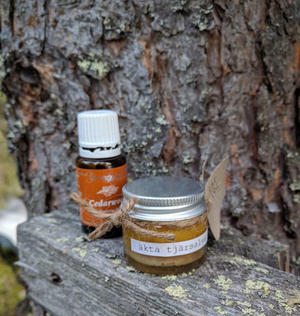 Contains: Resin from northern forests, organic canola oil, teatree oil, organic beeswax and natural vitamin E.
From the pine - a beneficial tar ointment. 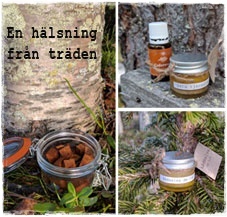 Contains: Tar from a tarry here nearby, organic canola oil, cedartree oil, organic beeswax and natural vitamin E.
And from the birch - chaga. 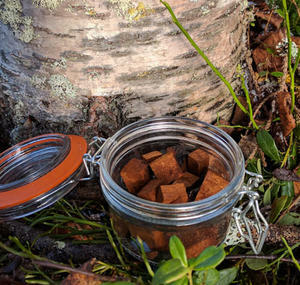 From this wonderful chaga you make a good tea. The Asians have used this for thousands of years to strengthen health. I have not crushed the chaga to powder like so many others do, I think it's much easier to handle when it's in bigger pieces. You can re-use the pieces up to 2-3 times before the active substances disappear. You can see that the tea will become brighter and lighter the more you use it, but a bag of 20gr (about 16 pieces) is enough for at least 4liters of chaga. Use about 8 pieces in a saucepan with 1 liter of water, boil up and simmer for about 20 minutes, then let it last and cool down for 3-4 hours. Then put it in a glass bottle and place in the refrigerator. The small pieces you used - let them dry for at least 2 days, then put them in a glass jar and re-use when needed. Packed in a bag of 16 pieces, about 20g. Tar ointment 15ml? Yes please (6.29) No thanks Chaga ca 20g?